Summer is here! As you spruce up your wardrobes for the season, don't forget about adding new accessories to brighten your home, too. We asked the city’s top interior designers what new trends can keep you and your home cool for the season. 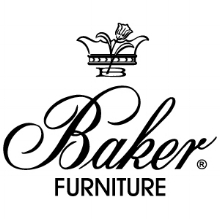 April 2016 — Leslie Hayes one of 20 designers in the U.S. chosen to attend Baker Furniture’s launch of French designer Jean Louis Deniot’s new collection at the bi-annual High Point Furniture Market in North Carolina. It was a wonderful exchange of ideas with some of the country’s most talented designers, providing a fresh perspective and much inspiration. Rarely will we feature one property here at Inside Look, but a single glance at this gorgeous, boutique condo on Pine Street made it clear: This beauty stands on her own. Originally built in 1837, 715 Pine St. underwent renovations earlier this year with Main Line interior design whiz Leslie Hayes. No detail was too miniscule to avoid Hayes' dramatic, wow-factor styling, from custom sculpted moldings in the entryway to the Old Hollywood-style media room and wet bar downstairs, replete with lush fabrics and glamorous hardware. Interior designer Leslie Hayes helped transform this house. Initially, Haverford-based interior designer Leslie Hayes was asked to transform the backyard of a certain Villanova home. The to-do list included making over two outdoor areas: a second-story patio off the family room and one at ground level directly below. The client also wanted Hayes to design a pool and the area surrounding it. Leslie Hayes loves a little drama in a room. “I think everyone wants the wow factor,” she says while explaining that high impact is something she has been testing out in the new Main Line home she calls a “laboratory for design.” Just a year ago, Hayes was approached to rent her Haverford home to a local sports figure and quickly needed to look for new digs and new projects. Surprisingly, the timing was perfect: Her friend Douglas Mellor was looking to move to Center City and asked Hayes to be the trustworthy custodian of an estate with just the kind of character that Hayes prized. What's the best way to punctuate a room? 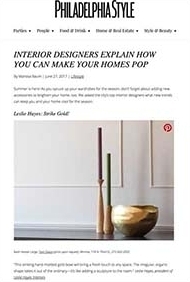 Haverford-based interior designer Leslie Hayes sheds a little light on home design. While the kitchen is easily Leslie Hayes' favorite room in her house, the Haverford-based interior designer doesn't play favorites when working with clients. "A mudroom can be as exciting as a living room, or a bedroom can become a boudoir retreat for private moments," says Hayes. "Each room has the possibility of creating something special." Personal decorating style: It ranges from contemporary-with-a-twist to mid-century modern. Most prized possessions: An old Italian-style chaise lounge that sits in my family room. Also, a large painting of a chicken with a tornado behind it painted by Tom Palamore; it has sophistication, yet it's a bit absurd. Designer who inspires her: Bobby McAlpine, an architect and interior designer. His use of scale and proportion is timeless. Her best piece of design advice: There's usually more than one great solution to designing a room. When the proposed concepts and elements come together and speak to the client, you know you have the right design solution. Design element she loves: A light fixture is a way to accent, enhance and punctuate a room. Favorite design trend of the moment: I love the light, monochromatic tone-on-tone palette that's popular right now. But I like to mix in design elements with contrast or color to provide the "wow" factor that makes a room extraordinary. Her definition of good taste: Refinement and style. Good taste is never forced. It's always a precious balance of style that looks effortless. Three words that sum up her style: Elegant, bold and comfortable. Best part of her job: Meeting the people I'm going to work with, and listening and understanding how they want to live in their homes.